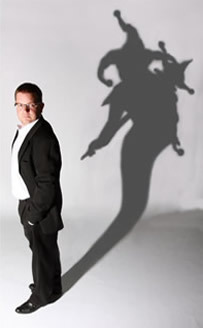 Stu began his show business career as part of a double act described by the President of the Magic Circle as "The Morecambe and Wise of Magic", whilst hard to please 'New Faces' critic Nina Myskow called him "Bloody Marvellous"! Supporting comedy legend Bob Monkhouse, appearing on TV with Des O'Connor and debuting at the London Palladium came next, and Stu now works as a solo act. He regularly performs at Her Majesty's Theatre, and is equally at home with cabaret audiences as he is with the (clamouring?) crowds of London's comedy clubs!